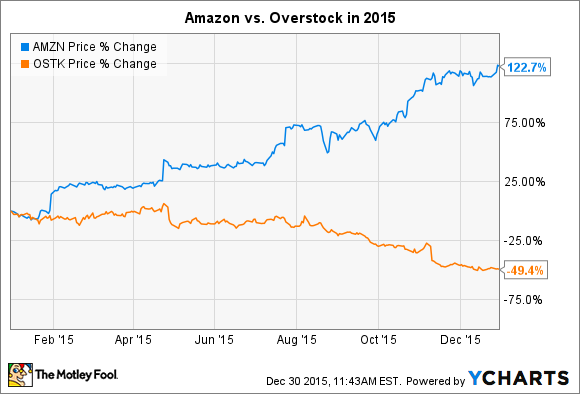 These stocks fell in 2015 -- and for good reasons. Tax loss selling, also known as tax loss harvesting, is a powerful tool in an investor's arsenal. With it, you can reduce your tax liability simply by exiting a losing position. In many cases, the loss you book can be used to lower your reported income or to offset gains you made elsewhere in your portfolio. Tax minimization shouldn't be the main reason you sell a stock. Instead, it's only worth considering if your investing thesis doesn't hold up against the company's current situation. In other words, the stock has fallen because of what appears to be a fundamental, long-term weakening of its operations. With that in mind, we asked three Motley Fool contributors for stocks they'd be happy to book losses on, given that their outlook has materially changed for the worse. Demitrios Kalogeropoulos (Overstock -- down roughly 50% in 2015): You might think that as e-commerce surged to consume a record share of the retailing pie this year, an online leader like Overstock.com (NASDAQ:OSTK) would perform well. After all, Internet selling titan Amazon.com (NASDAQ: AMZN) was one of the market's best stocks in 2015 as sales spiked higher at a 19% pace through the first nine months of the year. Amazon likely did even better over the holiday shopping season. But Overstock, a discount retailer of furniture, rugs, bedding, electronics, clothing, and jewelry, has had a far weaker showing. Revenue is flat over the last three quarters even as profitability has been pushed lower by price cuts. And what's worse, management missteps played a key role in that underwhelming result. In a November letter to shareholders, CEO Patrick Byrne pointed to several factors driving its weaker operations (including, amazingly, "[Federal Reserve Chairwoman] Janet Yellen's Magic Money Machine"). But chief among these issues was a change in search algorithms that pushed Overstock's product pages lower in search results. Byrne also took responsibility for his team's failed execution around a transition to loyalty points from discount coupons ("my bad," he said). Mistakes aside, executives believe they can turn things around with investments in marketing and in refreshing the business model. But I don't share that optimism, which is why I just joined the 220 All-Star players with a "thumbs-down" rating on this stock (vs. 66 "thumbs-ups") in Motley Fool Caps. Rich Duprey (SodaStream International -- down roughly 15% in 2015): Although at-home beverage maker SodaStream International (NASDAQ:SODA) has bounced some 25% off its recent lows, including a 10% jump early in December when it was announced shares will begin to be dually listed on the Tel Aviv stock exchange, its business remains at risk as it transitions from a DIY soda company to one that peddles water. Although its third-quarter earnings showed that, absent currency fluctuations, it was, well, treading water, turning in operating results that were about even with the year-ago period, that's not growth. SodaStream's stock has lost roughly 15% of its value in the past year, and it would've been worse had it not been for the bounce it got from its new exchange listing, but the euphoria that caused may not last. While Keurig Green Mountain blew an opportunity to steal significant market share from its rival by miscalculating how to enter the at-home market with a cold beverage appliance, it's a correctable problem -- and one that could prove troublesome. Coca-Cola is also bringing out a new Minute Maid brand flavored sparkling water. As this targets SodaStream's own narrow niche, even if it's not a DIY option, it will likely be price competitive considering the higher cost of SodaStream's own flavors. SodaStream's future looks shaky and now may be the perfect time to sell this stock and watch it safely from the sidelines. Daniel B. Kline (Sprint -- down roughly 15% in 2015): While Sprint (NYSE:S) stock has fallen in 2015, it's not the company's past, but its future that makes me suggest people cut their losses and sell. The wireless carrier, which has struggled to find a direction, won't dramatically reverse its fortunes any time soon. Instead, it's doomed to be an also-ran in the industry that has neither the best network nor the strongest value proposition. Under CEO Marcelo Claure, Sprint has tried to cast itself as a maverick, low-priced carrier. The problem is that the wireless industry already has one of those, and John Legere's T-Mobile does it better. Every move Claure has made feels like, or actually is, a copy of something T-Mobile has already done. That would be OK if the public was buying it, but it's not, and T-Mobile is growing rapidly while Sprint limps ahead, even after offering some extreme pricing deals. One of those offers -- the company's "cut your bill in half" promotion -- is actually part of the problem. The ads for the promotion make it clear that consumers will cut their bills in half. This is illustrated with chainsaws. Unfortunately, people who take advantage of the promotion don't actually cut their bills in half. They only save on the data portion. It's that sort of semi-deception that shows Claure and Sprint don't get it. In the cutthroat wireless market, there is simply no room to be the fourth-place carrier that's sort of, but not, like T-Mobile. This is a company slowly bleeding, and there is no reason to expect a turnaround anytime soon.